In anticipation of a visit from my mom this weekend, I am deep cleaning the two bathrooms in our apartment today (alas, this beauty is not one of them- it's from the Poetic Home blog). If your bathroom is less-than-lovely, here are some of my fave cleaning products that really do the trick. Just make sure you open a window or get the vent working, as some of these things will make you light-headed if you spend too much time in an enclosed space. I'm making an effort to start using greener cleaning products in other parts of the house- for the health of the environment as well as ourselves. But in all honesty, when it comes to the bathroom, my products can't be harsh and toxic enough- beach? chemicals? Bring 'em on! (Seriously, though, if you find green cleaning products that really work- let me know). 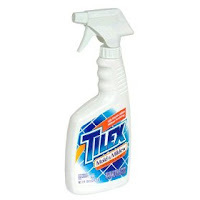 For mold and mildew that seems to sprout in the tiles, I use Tilex Mold & Mildew Remover . Spray it on the grout and caulking around your tub whenever things start looking a little icky. It's a miracle in a bottle. 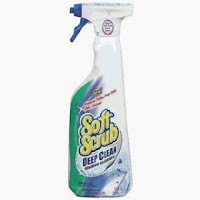 If you have a glass shower, I like Soft Scrub Deep Clean Spray . I just spray it all over the glass right when I finish taking my shower, and then rub the whole thing with the scratchy green side of a kitchen sponge, and rinse with the shower head. You only have to do it every few weeks and it totally gets rid of that gross fogginess caused by soap scum and lime and calcium deposits. 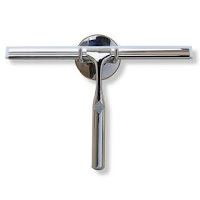 In between, I use a Shower Squeegee to dry the glass on a daily basis- call me crazy, but I think it's kind of fun. 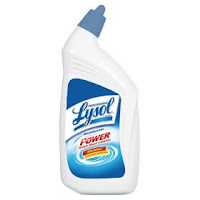 For the least pleasant part of the job, I use Lysol Power Toilet Bowl Cleaner . You just squirt it in the bowl and then give it a quick once-over with the toilet brush and flush- about as easy as it gets. For the upper part of the toilet and the seat, as well as the sink and bathtub, I use Antibacterial Fantastik. It works like a charm, and leaves everything sparkly clean. Maybe you'll actually use that tub to take a bath. Ecover is a green product that works surprisingly well--even on icky soap scum and mildew!